DescriptionEnsure all your guests know where the fun photo booth is by placing this wooden chalkboard effect sign in the direction of your photo booth. Can be used at either a wedding reception or any celebration! Sign measures 25.5cm W. String is tied to the sign so it can be hung. 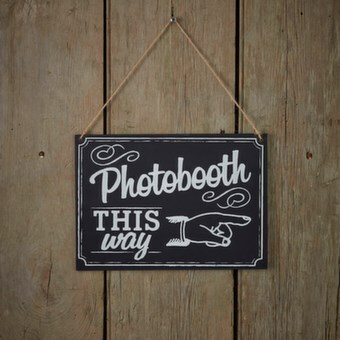 Ensure all your guests know where the fun photo booth is by placing this wooden chalkboard effect sign in the direction of your photo booth. Can be used at either a wedding reception or any celebration! Sign measures 25.5cm W. String is tied to the sign so it can be hung.